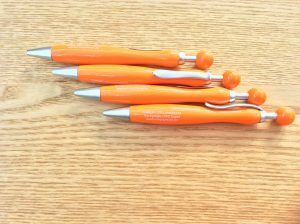 Get ready for CRPS awareness month with one of our latest CRPS support and awareness item – the CRPS Support and Awareness Notepad & Pen Set! You can now support CRPS awareness and Burning Nights CRPS Support when you purchase one of our Notepad & Pen Sets! Write your shopping lists, notes, lists etc on our A6 notepad with our exclusive orange pen! 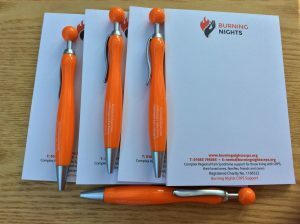 Up until now you have only been able to purchase one of our CRPS awareness pens, but now instead you can get the pen together with an A6 notepad. Why not consider purchasing this great set for a friend or family member or keep it for yourself and your lists/notes? 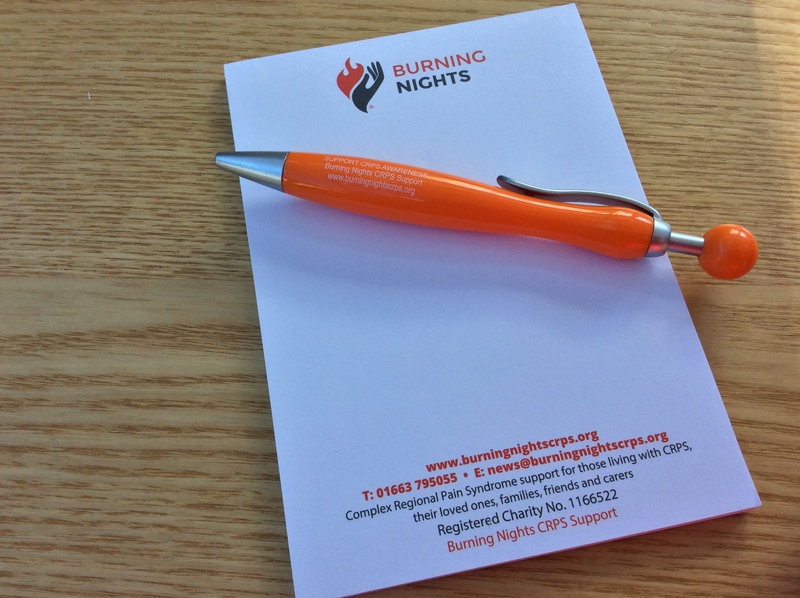 See all the necessary information about the CRPS Support Notepad & Pen Set below. 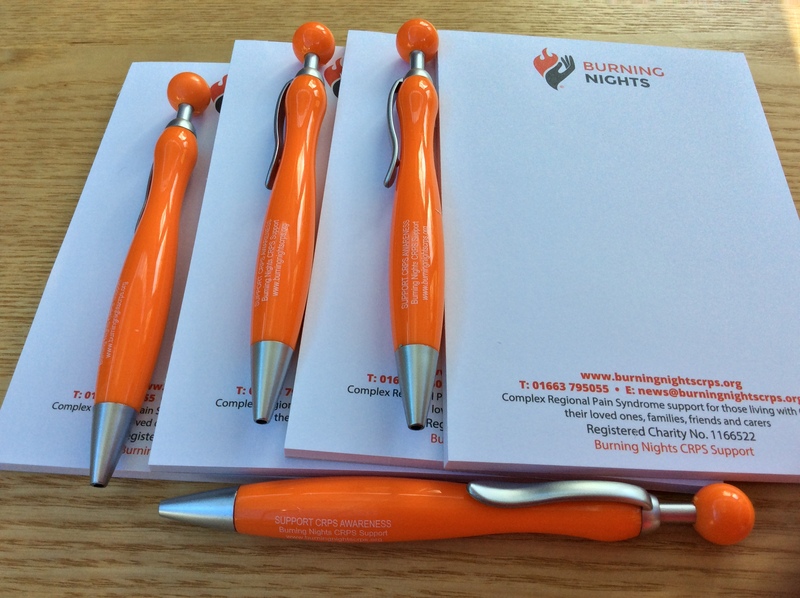 Each set contains 1 (one) A6 notepad and 1 (one) CRPS awareness orange pen. 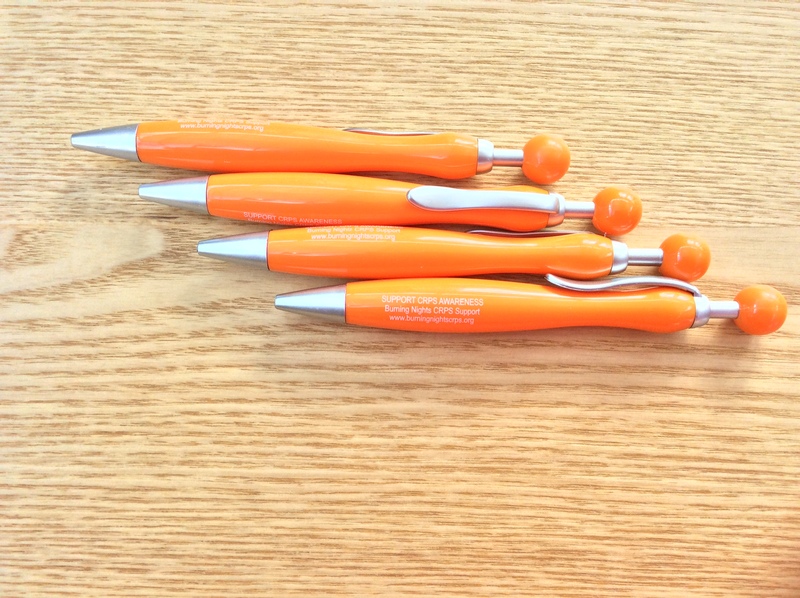 The pen is a vibrant orange ballpoint pen which writes in black ink. Postage & Packing is FREE to any single named address in the UK UP TO 200g. (Approx around 4-5 different items depending on the weight) Over 200g there is a FLAT RATE of £3. Remember to click on the CALCULATE SHIPPING COSTS. Don’t worry the shopping cart/basket will work everything out! 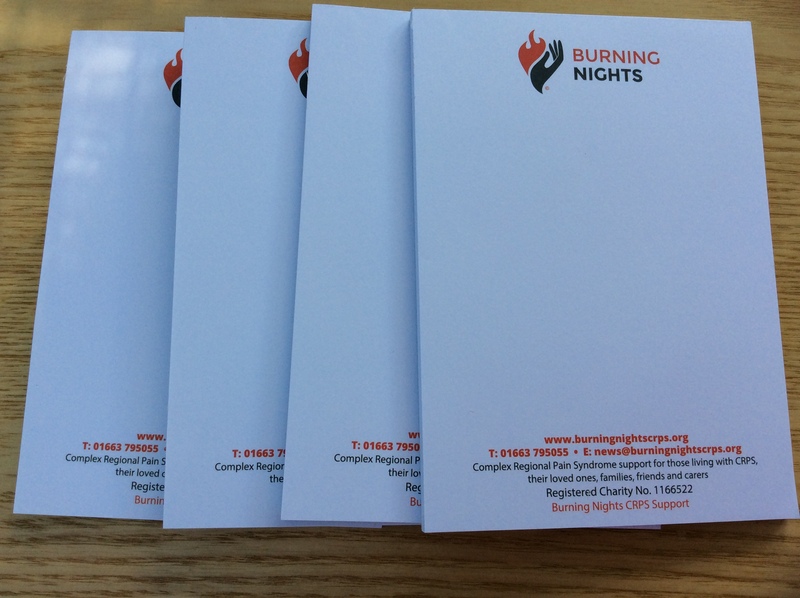 The reason for charging postage over 200g in UK & for posting outside UK is because Burning Nights CRPS Support is a charity, ordinarily postage is not being charged however due to the weight and cost of postage of approx 200g (approx 4/5 items) the postage can become quite expensive. PAYPAL & BANK TRANSFER are the ACCEPTED FORMS OF PAYMENT FOR ALL PRODUCTS. You do not need a PayPal account to pay, you can use your own credit/debit card to pay via PayPal. Want to pay by debit or credit card? Choose the PayPal option and pay as a guest only. You are able to pay in GB Pounds (£), US Dollars ($), Canadian Dollars ($), Australian Dollars ($), New Zealand Dollars ($) and the Euro (€). You do this by putting your required products into the cart and when you go to your cart you can choose your currency there. The currency will change daily due to the fluctuating markets. Are you ready for CRPS awareness month yet? Why not consider spreading awareness with our very latest CRPS Support and Awareness Notepad & Pet Set?! You can then support CRPS awareness every time you write your shopping lists or notes! 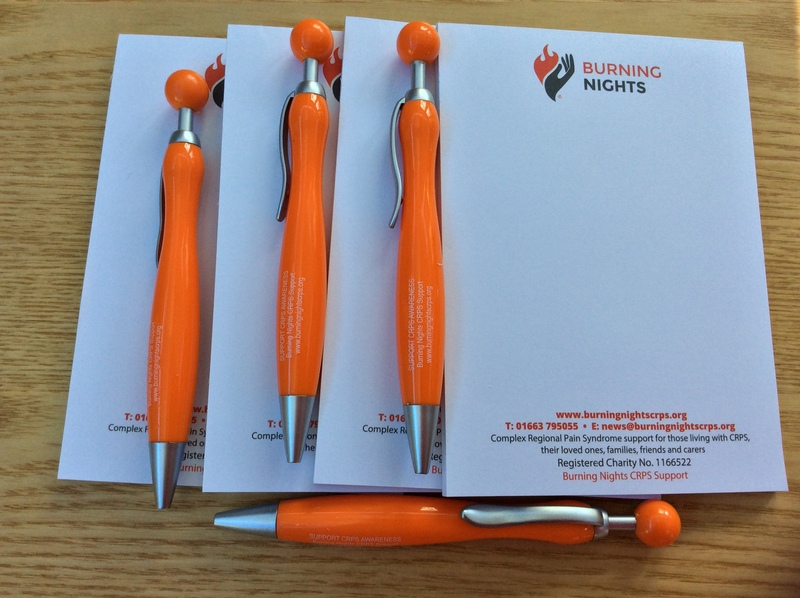 Up to now, you have only been able to purchase our Burning Nights CRPS Awareness orange pens but now why not consider buying this great A6 notepad and pen set instead?! Postage & Packing is FREE to any single named address in the UK UP TO 200g. (Approx around 4-5 different items depending) Over 200g there is a FLAT RATE of £3. Remember to click on the CALCULATE SHIPPING COSTS. Don’t worry the shopping cart/basket will work everything out! OUTSIDE UK? If you are outside the UK and want to order any of the products, YES THIS IS POSSIBLE! Burning Nights can deliver to most countries worldwide. Click on the CALCULATE SHIPPING COSTS in the shopping cart/basket! Posting outside UK can take approximately 7 – 10 working days. 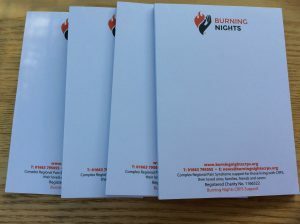 The reason for charging postage over 200g in UK & for posting outside UK is because Burning Nights CRPS Support is a registered charity, and to keep costs down as much as possible postage can become expensive if 4 or more items are purchased (approx. 200 gms) Ordinarily postage is not being charged.